All of us have circumstances and we must navigate them to the best of our abilities; the cleanest definition of circumstance is: ‘An event or fact that causes or helps to cause something to happen, typically something undesirable.’ We are all subject to undesirable events, but we are not our condition; Benjamin Disraeli puts it this way: ‘People are not the creature of circumstances, circumstances are the creatures of People.’ So how does one stop being mired in an avalanche of circumstances? Simple: Reflect and Review. 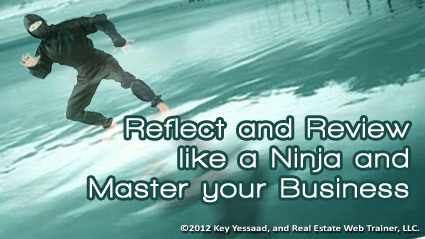 As the days of your week add challenges that you must tackle, some will fall through the cracks of time, but if you put on your Ninja suit of Weekly Reflection and Review you will be able to catch them, organize them, frame their importance, and plan the right next action. Remember that you are in charge of your destiny, and weekly reviews will help you continue on the path of business mastery!